I have had problematic skin on my chin and jaw line, stemming from stress and hormonal issues, for over four years now. It manifests as constant bumps under my skin that develop into pimples that contain hard cores of sebum within them. Sorry for the graphic description! I have never been able to successfully break this cycle with products. I find that certain products help clear my skin dramatically and fade scarring, but never prevent the bumps from appearing. Recently, I was at my wits end with my acne, having tried seemingly everything without amazing results. I was online filling one of my regular orders with iHerb, when something inside me stirred and I found myself adding Mad Hippie's Exfoliating Serum to my cart. 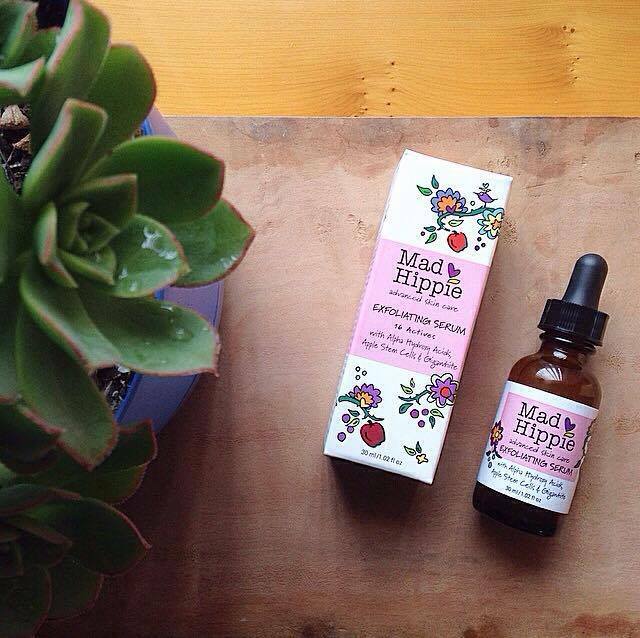 I hadn't tried anything of Mad Hippie's yet, but had heard many raving reviews of the brand. Plus, one of the few things I hadn't tried for my skin yet was a leave-on exfoliating product. Phew! 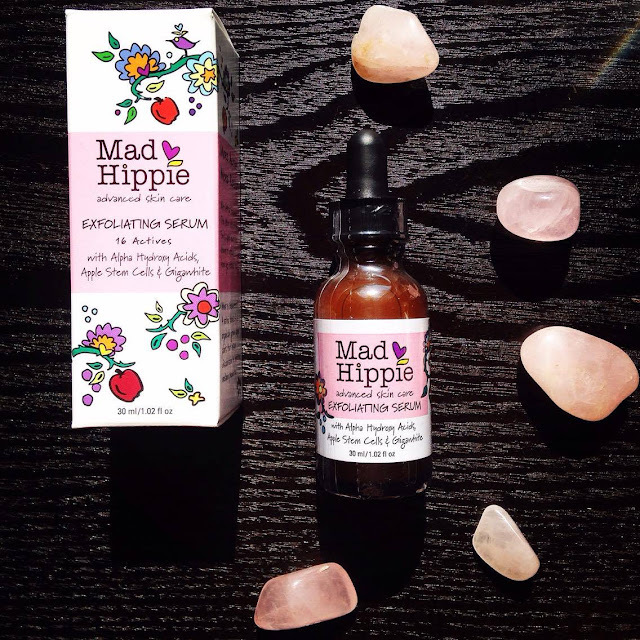 Sorry for that long introduction; now I will get to explaining why Mad Hippie's Exfoliating Serum is now a permanent staple in my skincare cabinet, and why I consider it a holy grail product. This was my first time using a chemical exfoliant in a leave-on product. Mad Hippie uses both glycolic and lactic acid to exfoliate and remove dead skin cells, thereby reducing clogged pores, and dull and damaged skin. This exfoliating serum is more aimed at reducing skin discolouration and wrinkles, but I also feel that it is suited to clogged skin types and those prone to acne scarring, like me. 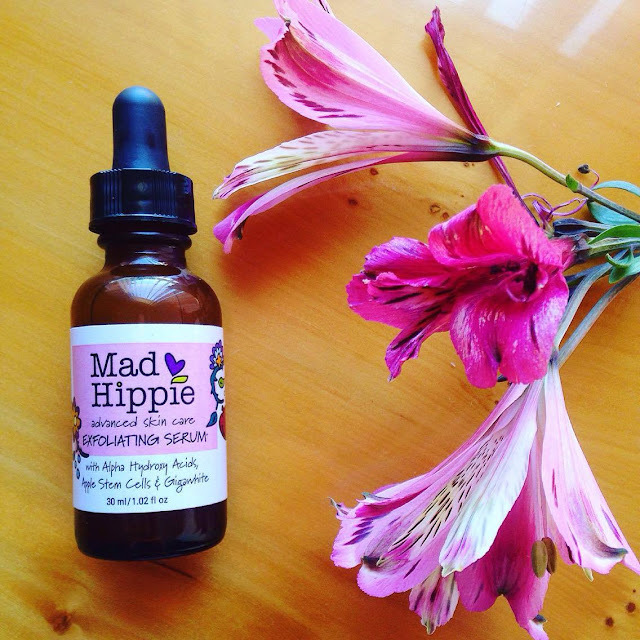 Mad Hippie's Exfoliating Serum amazing ingredients aren't limited to glycolic and lactic acid, however. It contains Gigawhite, which is a blend of 6 organically grown alpine plants which have a dramatic brightening and evening effect on skin tones. It also contains sodium hyaluronate and ceramides to help skin retain moisture and plump up skin. Skin loving ingredients such as goji berry and white tea are packed with antioxidants to neutralise free radicals, and vitamin C promotes collagen production, and brightens the skin. Matrixyl Synthe ‘6 is also a powerful skin anti-ageing peptide that is employed to smooth the skin and reduce the appearance of wrinkles. This serum also contains apple stem cells to reduce age related deterioration of the skin. Ingredients: Water, glycolic acid, hydrolyzed vegetable protein PG-propyl silanetriol, vitamin B5 (panthenol), lactic acid, matrixyl Synthe' 6, (glycerin-water-hydroxypropyl cyclodextrin-palmitoyl tripeptide-38), vitamin C (sodium ascorbyl phosphate), potassium hydroxide, niacinamide, sodium hyaluronate, white tea extract (camelia sinensis), goji berry extract (lycium barbarum), polysorbate 20, xantham gum, phytocelltec (malus domestica fruit cell culture extract, xanthan gum, glycerin, lecithin, phenoxyethanol, water), gigawhite (water, glycerin, malva sylvestris (mallow) extract, mentha piperita (peppermint) leaf extract, primula veris extract, alchemilla vulgaris extract, veronica officinalis extract, melissa officinalis leaf extract, achillea millefolium extract), methyl cellulose, glycerin, melatonin, caffeine, biotin, tocopheryl, ceramide 3, squalene, behentrimonium chloride, hydrolyzed soy protein, potassium citrate. I apply Mad Hippie's Exfoliating Serum to a dry face after cleansing. I use it all over my face, as I have the beginning of sun damage on my cheeks and forehead, and enlarged pores in my T-Zone, as well as clogged pores in my chin area. I leave it for a few minutes for my skin to absorb the actives (Mad Hippie recommend 10 minutes), then apply a face oil and/or a moisturiser. It dries quickly on my skin and leaves my skin feeling comfortable and hydrated, but slightly sticky, which I find fully dissipates following the application of a moisturiser. As for my results? I have noticed over the few months I have been using this serum (every second night), that as my skin purged the ickiness underneath the surface, the amount of bumps on my chin area started to decrease rapidly and has continued to decrease with time. I now have dramatically less clogged pores, which makes me want to cry with relief. I also notice that pigmentation following a breakout fades much faster due to increased skin turnover. The pores in my T-Zone have decreased in appearance, also. Basically, this serum is a miracle product for me, and I don't use that word lightly. If you suffer from persistent hormonal acne like mine, please know that I know too well how confidence bursting it is. I really recommend giving this serum a try to see if it works for you like it did me. I got Mad Hippie's Exfoliating Serum from iHerb here, or you can purchase on the Mad Hippie website.